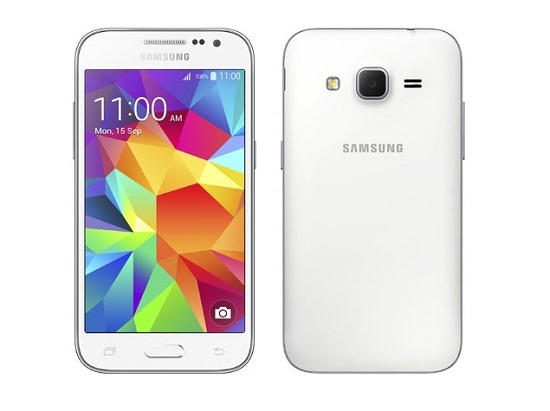 Samsung has silently launched Galaxy Core Prime in India priced at 8,499 INR. This time Samsung has compiled better spec sheet than what we usually see in Samsung phones under 10k. The South Korean giant enjoys a huge loyalty base in India and we can expect this new budget Galaxy device to be well received as well. Let’s take a look at the hardware. Samsung Galaxy Core Prime features a 5 MP rear camera which can record full HD 1080p videos. The auto focus primary shooter supports 7 camera modes and LED flash for low light photography. A 2 MP front snapper is also present for video recording. Imaging hardware is decent enough in this price range. Internal Storage is 8 GB and can be further expanded to 64 GB using MicroSD card slot. The storage is again at par with what others are offering and we are glad to see Samsung drifting away from 4 GB native storage model. The processor used is 1.3 GHz quad core SoC aided by 1 GB RAM. Chipset details haven’t been specified as of now, but Samsung is most likely using MediaTek MT6582 this time instead of the qualcomm chipset it generally prefers. The chipset has been well tested over time and has emerged as a decent performer. Battery capacity is 2000 mAh which is again average in this price range. Samsung hasn’t revealed the battery stats as of yet, but considering the display and chipset employed, it can be expected to last for one day moderate usage. The display is 4.5 inches in size with modest WVGA 480X 800 resolution. This amounts to 207 ppi, which is fairly usable, though not dazzling on the PLS display. Since it’s a PLS display, we can expect good viewing angles comparable to IPS LCD. The handset runs on latest Android 4.4.2 Kitkat and houses only 1 SIM card slot. Other features include Accelerometer, Proximity Sensor, Battery saving mode, 3G, Bluetooth and GPS. Samsung Galaxy Core Prime will compete against phones Xiaomi Redmi 1S, Asus Zenfone 5, Zenfone 4.5 and Samsung’s own Galaxy Core Advance. With Galaxy Core Prime, Samsung is trying to appease budget oriented consumers by flaunting a more conventional spec sheet. Since the flipkart listing has been removed and the handset hasn’t been officially announced yet, final price and availability remains uncertain as of now. On the whole Samsung Galaxy Core Prime looks like a decent budget Android device from the leading Android brand Samsung. One can only surmise that Samsung expects a huge premium for a sub premium phone….No wonder it is struggling….providing value for money is key to success. Look at Xiaomi..selling almost 4 lakh Redmi 1S in total 6 hrs sale time…VFM is name of game.